Enjoy the relaxing atmosphere of our unique European styled motel right in the heart of Paihia. We are just 5 minutes walk from all the restaurants, cafe's and also the wharf. 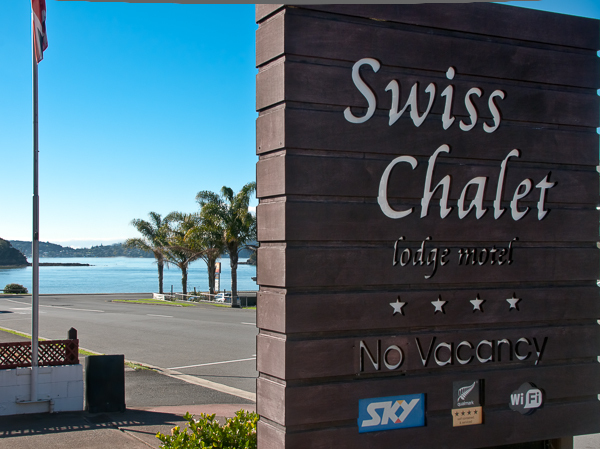 The Swiss Chalet Lodge Motel has apartments that can suit couples as well as larger groups offering studio's as well as a 2 bedroom and a 3 bedroom apartment that are both interconnected to become 5 bedrooms if this is needed. Our apartments all have balconies and some have magnificent sea views. Our experienced tour desk can help you plan your stay to take advantage of all that the Bay of Islands has to offer.